Additive manufacturing processes can produce parts with the most complex geometries in a single operation. However, post-processing these 3D printed parts is time consuming and costly. In order to remove this bottleneck in the pro-duction process, PostProcess Technologies has developed a series of machines that leverage a ground-breaking chemistry of detergents and abrasive media. The newest example is the Hybrid DECI Duo. The multi-functional machine pro-vides automated removal of support material and surface finishing. It was automated with control technology from Beckhoff. The challenges of post-print processing in additive manufacturing include surface finishing and the removal of support material. Particularly when building complex geometries and structures via 3D printer, any overhangs or other asymmetrical contours require the use of support materials. These ensure that the workpiece does not collapse during production and they maintain the correct shape of the part during printing. The support materials must be removed afterward, creating inefficiencies. In addition, the parts printed from materials such as advanced thermoplastics, light-cured resins and metals often require finishing to achieve the desired look and feel, while still meeting the requirements for correct size, texture and precision. 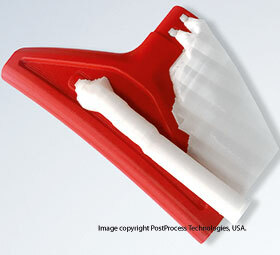 PostProcess Technologies, a start-up designated company headquartered in Buffalo, New York, was founded in 2013 with the vision to revolutionise additive manufacturing by removing the post-print bottleneck and thus paving the way to economical series production. The aim was to translate the diligence and accuracy of manual finishing into a fast, automated process. As PostProcess began to implement its machines, partnering with Keller Technology, a global custom manufacturer, the company knew it needed proven, robust automation components. Since most of the 3D printers are not PLC driven, but rather PC driven, they decided to use PC-based control technology from Beckhoff. PostProcess has developed a range of different machines for removing support materials or surface finishing. The newest addition to their product offering is the Hybrid DECI Duo, the first multi-functioning machine that combines both processes in a single compact system that helps optimise valuable production floor space. In combination with TwinCAT 3 software, the CP6706 Panel PC with a 7-inch touchscreen and quad-core Intel Atom processor serves as the all-in-one control and HMI for the Hybrid DECI Duo system. EtherCAT I/O terminals are installed across all PostProcess lines. According to Hutchinson, this provides maximum flexibility and streamlines future expansion. Safety technology is also integrated in the EtherCAT I/O system. Special safety equipment such as e-stops and guard doors are easily connected via TwinSAFE I/O terminals. As the 3D printing and additive manufacturing market continues to evolve at a rapid pace, it is exactly this level of flexibility that will help OEMs like PostProcess shape the future of the industry.